An international coalition has said that overall pledges for 2016 fall more than US$3bn short of what is urgently needed in response to the Syria crisis. A record of pledges made by world leaders at the Supporting Syria and the Region conference on 4 February 2016. We'll keep updating this throughout the day. A set of images to share on social media to promote the Support Syria civil society conference and the themes of the event: education, protection and jobs. Curated examples of the work of NGOs with Syrian people in Syria and the region, supporting the themes and demands of the Supporting Syria civil society conference. Below, you'll also find resources to share on social media and films of the plenary discussions at the civil society conference. We also have a tracker of pledges at the world leaders' conference, and there's a web album of creative commons images of the day. If you have useful material you think we should include here, please let us know. A new all-female Lebanon team is making land safe for 4,500 people, many of whom are Syrian refugees. Doctors of the World have created an app that uses smartphone technology to locate nearby clinics for refugees travelling through Europe. This library of video content and other resources is freely available to NGOs and all humanitarian agencies working on the Syria refugee crisis. 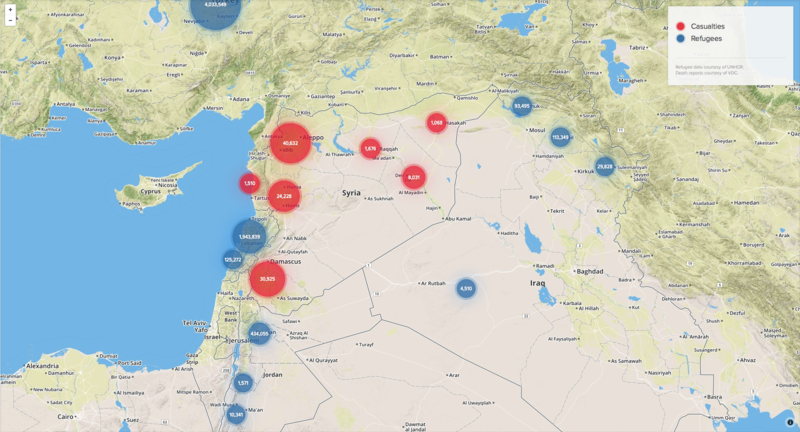 This resource for journalists in Syria provides essential information on safety, digital security and trauma support, and direct, secure access to emergency assistance. This information sharing portal includes reports, statistics, situation updates, UNHCR funding requirements and details of partner activites. Use these graphics and infographics to promote the Supporting Syria and the Region conference on social media with the hashtag #SupportSyrians. This briefing gives a rapid overview of some of the world’s most fragile situations and highlights actions which key influencers can take to ensure the UK government most effectively delivers on its moral and political responsibilities. We call on leaders to take urgent action on Syria to respond effectively and in a timely manner to the most devastating humanitarian crisis of our generation. World leaders must commit to an ambitious and transformational new multi-billion dollar deal for Syrian refugees at the Supporting Syria and the Region conference, a global coalition of more than ninety humanitarian and human rights groups has said. In the scramble to address the deepening refugee crisis, policymakers, big tech companies, and advocates are turning to the smartphone to find a solution. But the reality is that no learning app or technology will improve education by itself, says Mark Latonero. Countries who attended the Supporting Syria conference in London have so far only committed a sixth of the money they pledged for 2016, a new report by Concern Worldwide shows. Muslim NGOs are being discriminated against by donors & banks, say former U.K. Department for International Development chiefs, Clare Short and Andrew Mitchell. Video: Five years on, what next for Syria? Bringing together leading humanitarian officials, Syrian aid workers and experts, this video of a recent panel discussion reflects on the impact of the war and look at how to help people in Syria survive – and even rebuild and recover – as the war continues. After the opening week of peace talks aimed at ending the war in Syria were suspended only three days after they began, Devex shares a recent call from humanitarian organisations to stop the suffering and place pressure on all parties to end the blockade on urgently needed humanitarian assistance. NGOs are attempting to provide jobs but immediate humanitarian needs are overwhelming moves towards longer term solutions for people in Syria.